Note: You will need a quantity of pure iodine and you should know that iodine is monitored by the FEDs because it just happens to be one of the chemicals used in the making of meth. So if you are planning on making any quantity atomidine beyond your personal use, you are going to have to get a license from the FEDs. SUPPORT COPPER AND NICKLE RODS BY DRILLING ½ “ HOLE ON EITHER SIDE OF WHERE FLASK WILL BE HELD IN PLACE. 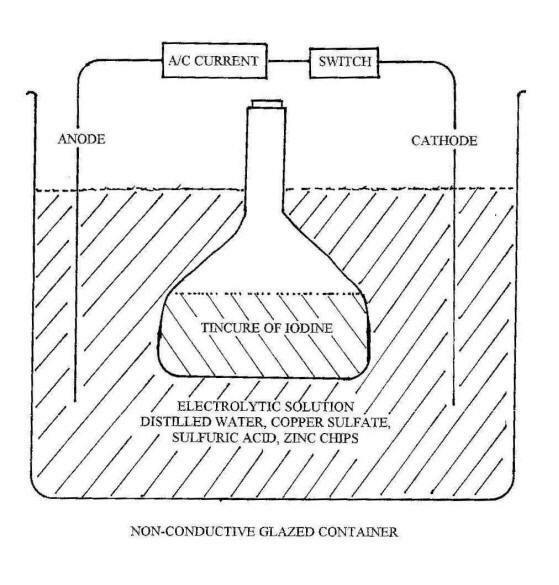 A SUPPORT DEVICE (CLAMP ON HEAVY DEVICE) TO HOLD A FLASK WITH A GLASS STOPPER, BETWEEN THE RODS, WITH THE IODINE SOLUTION DOWN BENEATH THE SURFACE OF THE ELECTROLYTIC LIQUID. A LONG NECK GLASS FLASK, WITH GLASS STOPPER FOR HOLDING TINCTURE OF IODINE SOLUTION, STOPPER ATTACHED WITH WIRE, ALLOWS HEATED GAS IN BOTTLE TO ESCAPE BUT KEEPS STOPPER FROM BEING SHOT OFF FLASK. HOOKING THREE 10 GALLON CONTAINERS IN SERIES HELPS KEEP TEMPERATURE DOWN, THE MORE LIQUID THE LONGER TO HEAT. ELECTROLYTIC BATH SHOULD BE REPLACED WHEN IT NO LONGER HAS A CHARGE. WITH A/C CONNECTION REMOVED A CHARGE BETWEEN RODS SHOULD SHOW ON VOLT METER OR REPLACE EVERY MONTH. IF MUCH CHARGING OF NASCENT IODINE THEN MAYBE EVERY WEEK. CARE SHOULD BE TAKEN IN SETTING THIS UP.